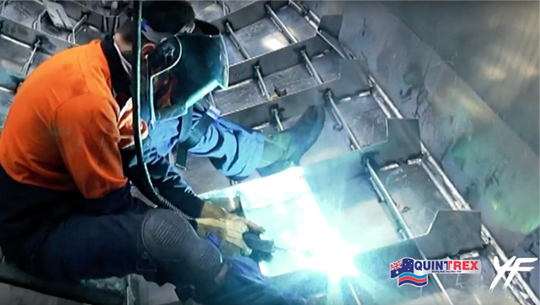 Every Yellowfin is handcrafted in our Gold Coast based specialized plate boat factory by a team 10 highly skilled Plate Boat Specialist welders. With over 100 hours of welding in each Yellowfin our technicians pride themselves on producing only quality products. The journey to become a Yellowfin Specialist begins with small tinnies, this lays the foundation of marine knowledge as well as tests skills and certification. The next step is to become a professional at building more complicated medium sized aluminum boats, challenging workers to hone their skills to perfection. Finally workers are selected to be part of the Yellowfin Plate Boat team, a group of Plate Boat Specialists and the most sought-after position in all of marine manufacturing. Yellowfin Plate Boat Specialists take welding, painting and final assembly to a higher level. Trained by experts to be Plate Boat Specialists, each offshore boat has quality that you can see and feel. 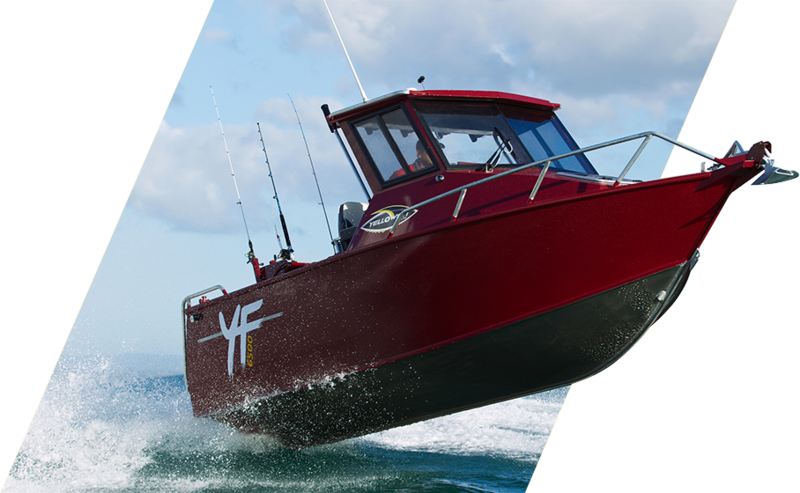 Yellowfin Plate boats are Hand Built Tough designed by 8 full time Research and Development professionals with over 150 years of combined marine design expertise. 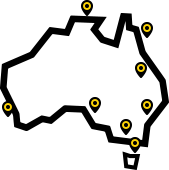 Their diverse backgrounds include mechanical engineering, hands on sheet metal and broiler fabrication, and certification in AutoCAD/Solid Works computer program design. Fishos themselves, the R&D Team can be found tournament fishing, camping and boating on their free time. These lucky individuals get to work in an industry they are passionate about. Their combined marine experience and passion for boating is what stands behind the Yellowfin Innovation. It’s what’s under the floor that makes Yellowfin Plate Boats some of the toughest on the market. The entire range is built with an internal sub frame, milk crate structure of longitudinal and latitudinal ribs to reinforce strength and help shape the Hull. Each boat is constructed with vertical stringers each being 6mm thick and 5mm horizontal ribs for maximum strength and completed with a fully welded checker plate floor. To provide additional support to the self- draining checker plate floor a box section floor frame is also fitted. Using extrusion specifically designed for marine products the chine and the keel are not simply welded but re-enforced by a total of 4 welds performed by an expert technician. Constructed with 6mm plate bottom sheets of marine grade aluminium and 4mm topsides the Yellowfin Plate Range is built for serious fishing and we challenge you to find a tougher boat out there. Made for offshore action the entire Yellowfin Plate Range comes complete with specialised technology to ensure your deck stays dry no matter the weather conditions. The Auto Drain Deck expels water quickly and efficiently from the hull with a rear gutter which guides excess water to a lower chamber ready to be pumped out. Separate to the underfloor bilge pump Auto Drain Deck offers you another layer of safety. The ocean can turn at anytime and its then that you need a reliable and predictable riding hull to ensure an easy ride to your destination every time. Our Offshore HD Hull offers just that, and we stand by it as the epitome of open water performance. Our seriously tough Offshore HD Hull is constructed with 6mm plate bottom sheets and complete with a sharp entry point and 19-degree variable deadrise Yellowfin boats handle swell with ease for a soft and reliable ride. The Reverse Chine works to deflect spray away from the boat and enhances stability. You can rest assured the Yellowfin range is built to Australian recreational boat standards. Yellowfin Plate Boats is the oldest builder in Australian, a heritage that started back in 1984. Years of experience and honing skills is what has made it one of the most trusted boats in the country. Trust that you can take miles offshore. A good reputation does not happen overnight, it comes from consistent customer satisfaction and exceeding expectations. Since the beginning, Yellowfin Plate Boats was known for its superior design and part of this can been seen in the development of the current HD Hull. Yellowfin Plate Boat Customers are proud owners confident in their purchase and happy to talk about their experiences. We spend over 150 hours handcrafting each Yellowfin package while only allowing the highest quality utensils and workmanship to produce the ultimate offshore boats to ensure we have the best layout, design, hull performance, quality and price on the market. Learn more about our construction process here.